This project involved the entire refurbishment of a beautiful three-bedroom house in Ealing Park Road in Ealing, West London, and required our expertise in a number of different areas, from planning the best way to do things, right through to tiling and finishes once all the installation work had been completed. The main decisions revolved around how best to plan the heating system. The property has two floors: the ground floor which had just been significantly extended to the rear and the side and the upstairs floor, which is mainly bedrooms. Like most families, our clients spend most of their time on the ground floor which includes the kitchen and the main living areas, hence it was best to design the heating system so that the two floors can be heated independently of each other to avoid wasting money or energy heating an area that is not being used as much. The fact that heat rises made this even more sensible. The old part of the ground floor, prior to the extension, had beautiful old style freestanding radiators, as did the upstairs floor. As a result, we left all these radiators in place and installed under floor heating in the extension, split into three zones – the dining room, the kitchen and the new shower room / wet room. We installed a new boiler, a Worcester Bosch, as well as a MegaFlow hot water cylinder as part of an unvented hot water system. In addition to running all the new pipework (hot, cold, gas, flow and return) and all new wastes, soil and vent pipework, we also installed a brand new upgraded mains water supply to ensure quality of flow and water pressure throughout the property. 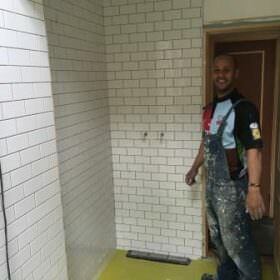 One of the features of the new refurbishment is a ground floor shower room / wet room, which we tiled and finished after all of the plumbing work had been done.